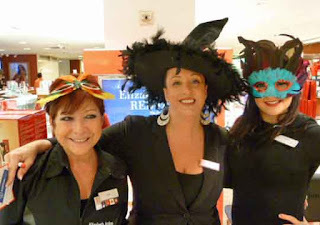 Halloween for the Beauty Department at Macy’s Herald Square is just one blast of fun and true creativity. 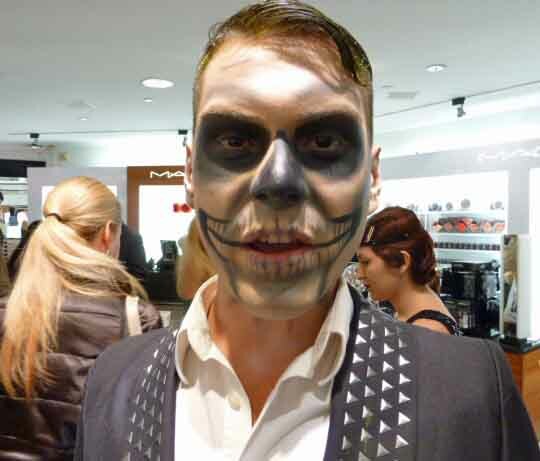 The Makeup Artists from some of the best known brands put on their Halloween makeup and give the Macys shoppers all the fun that Halloween can offer. The beauty department staff arrives at the store dressed to kill and show off their makeup theatrical skills. 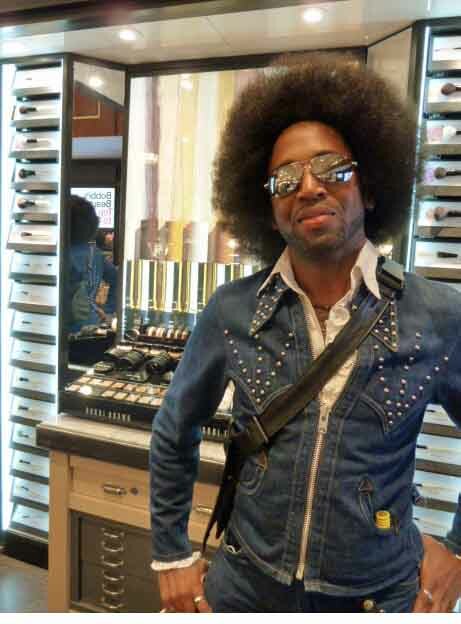 To begin with you can’t go past William the Makeup Artist from YSL who every year puts in so much effort that he is constantly photographed by all the visitors. In 2009 William came as ” Zoro”, mask and whip in hand he moved with a great flourish around the YSLcounter, in 2010 he delighted the crowd as the “Mad Hatter” and this year he paid homage to “Puss in Boots” meowing and lifting his sword high. At YSL this year they continued to promote their SHOCKING line of makeup and their new skin care TOP SECRETS which has become so popular for YSL at Macy’s. Estee Lauder who have a large counter and a great team, there was Dawn who came as ” Mystique X-Men”, with her body encased in a bluish rubber suit, completed with a face of blue makeup, and small eyelash extensions patterned over her cheeks, deep dark red hair pulled away from her face, she was a popular icon photographed by the crowds. 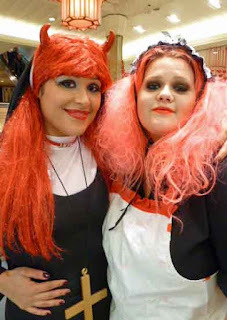 So was Brittany dressed from the Rock Horror Show, she always puts in an iconic appearance every year, Brittany photographed with Jessica who was a nun having a real devil of a time. Denisse also with Lauder dressed as the iconic Natalie Portman from the Black Swan, wearing her black tutu and exaggerated eye makeup, stood with Laura as they highlighted the new Estee Lauder “Idealist Even Skintone Illuminator” a perfect product to use after you take off that Halloween makeup. Bobbi Brown was fortunate enough to have one of the “Commodores” at the counter by courtesy of their makeup artist Jose Freeman who stood by Bobbi Brown’s “Mineral Makeup Reinvented” to give Macys customers a new look from a classic stand by, playing a really cool makeup artist at Bobbi Brown. Over at Sue Devitt, Cary their makeup artist introduced the Nordic Trek Line of lipsticks, eyeliners and quad shadows from Sue Devitt, he was made up head to toe and sporting a perfect set of long nails which a lot of Macys customers admired while he showed the new Nordic Trek Line to mesmerized customers. 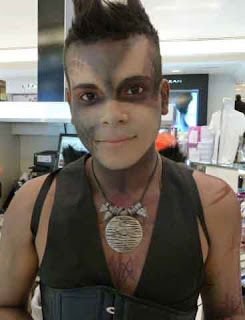 At MAC Cosmetics they are always in such a creative mood, the team pulled out all the stops Alex Palacios MAC Makeup Artist was so busy with a line of Macys customers all waiting to have the new collection of “Glitter and Ice” on their eyes, lips and nails, the promotional image of Johnny Weir wearing the collection drew the crowds into the MAC makeup area. 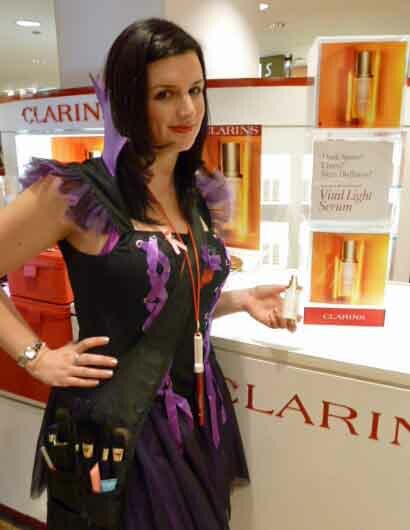 Sarah from Clarins was selling with great success the new Vital Light day and night cream, suitable for every skin type to work on diminishing hyper pigmentation, a collection of botanical ingredients to soothe and brighten the skin after all those Halloween parties. 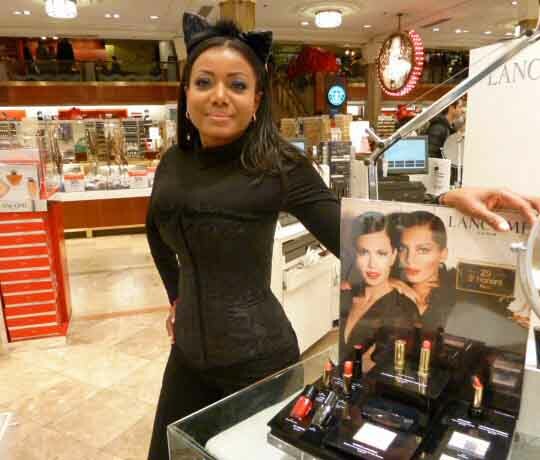 The Lancôme counter had perhaps one of the smallest waists on Nicole who in her cat outfit promoted Lancôme’s 2011 Fall Color Collection, named after its original Parisian boutique at 29 St. Honoré , revisiting the classic femme fatale era when timeless cult makeup products were born, maybe not so easy to revisit the tiny waist we saw on Nicole, but we can always remember Halloween at Macy’s Herald Square New York.